This short-sleeved organic baby body is blue with a sailing boat design and a navy trim. Soft, comfy and practical too, it looks great with baby pants or under a pair of dungarees or dress. Poppers on the neck make getting dressed easy. Mix or match with items from the Maxomorra range for a super Scandi outfit. Made with soft organic cotton, it is gentle on delicate skin and eco-friendly too. 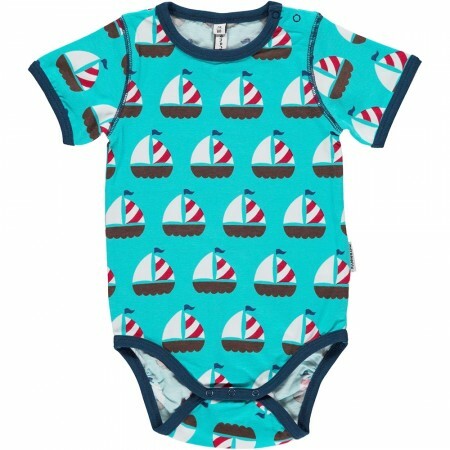 This baby body was made using jersey fabric, made with 95% GOTS certified organic cotton and 5% elastane.